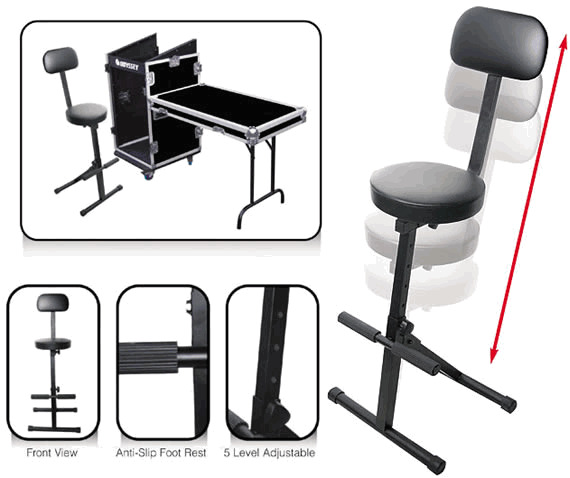 Odyssey Adjustable Heights DJ Chair DJParts - All Variety of Parts that DJ Needs. Odyssey once again introduces a product you can use at every gig. The DJ Chair from Odyssey allows you to sit back at a confortable height while reducing fatigue and stress on your back and legs during those long gigs. The 5 adjustment levels, from 19" to 33", make you look cool without the appearance of sitting back on the job.